A Leslie rotating speaker sounds great on an Hammond organ, but it makes a guitar sound incredible!. 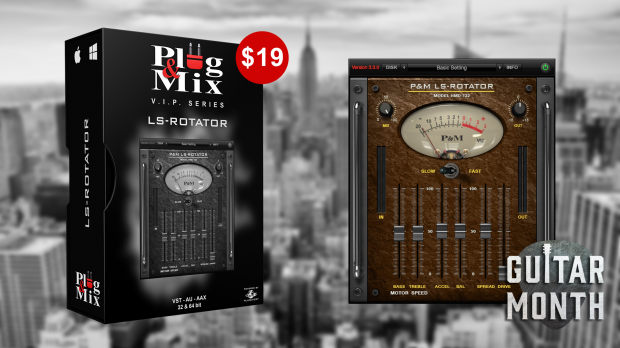 P&M’s Ls Rotator will transform your guitar tracks into a work of art for only $19. This plug-in gives you the famous classic sound of a Leslie rotating speaker. The Leslie speaker has two elements – the lower and upper rotor. This effect has been used to add a special swirling sound to guitars, keyboards and even vocals on countless hit records. This entry was posted in DontCrack, Plug & Mix, Plug-ins, Promotions and tagged Leslie rotating speaker, Ls Rotator, Plug & Mix, Plug and Mix. Bookmark the permalink.